Forum Index > Historical Arms Talk > English Basket-hilted rapier- any info? 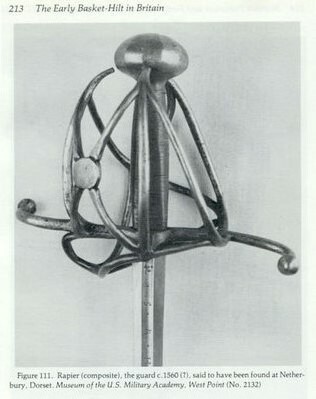 Posted: Fri 11 May, 2018 7:24 am Post subject: English Basket-hilted rapier- any info? I'm assuming its the same weapon in both pictures. And, these are the only pictures that I can find of it. In the notes on the image it is in the West Point Museum, or was. Unfortunately, they don't have a searchable database of their collections. Does anyone know more about this sword or have any other images that they'd be happy to share. I think it looks like an attractive hilt on a rapier and I'd like to try to replicate it. Does its construction follow the typical "Mary Rose"-type of hilt construction like in the third picture? It looks like there is, perhaps, another bar running below the quillons , parallel to the bar visible on the back-of-the-hand side. The term "Composite" in the description means that's it's known to be composed of parts from different weapons. There must be some clear evidence of that. The blade might be dated significantly later. Probably not earlier. Doesn't mean this wasn't a working-life exchange. Yep, That's what I took "composite" to mean. 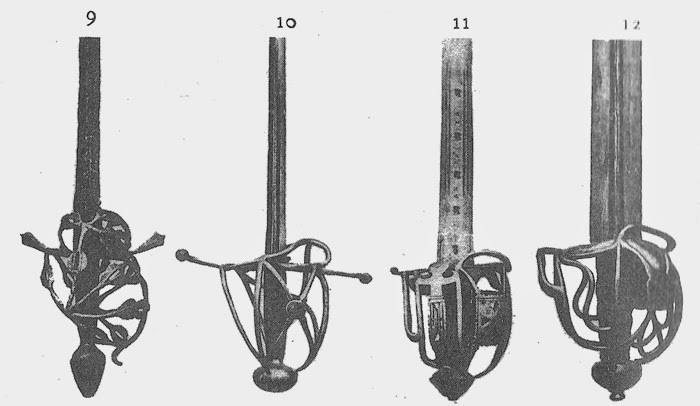 Searching for images of other "Composite Rapiers" seem to show rapiers that, as you say, had blades that were fitted with hilts from other, perhaps broken?, weapons. In this case, it's easy to imagine a working life change. If you have a perfectly good hilt on an old broken blade, or if you don't really use a weapon but want to update for reasons of fashion, this would be a reasonable and functional choice. Of course, it also could have been slapped together in 1850. Of course, it also could have been slapped together in 1850. Without knowing the provenance of the weapon in the image, I wouldn't be surprised at all if that were the case. In the working lifetime of that basket hilt, I would image it would have been matched to another backsword-ish type blade, but could see some Victorians throwing a rapier blade on it.